What a great idea! A simple three-oscillator synth that anyone can master in minutes, with a solid sound and enough modulation to keep things interesting. Nice waveforms. Clear layout. Good sound. Easy to program. Just 47 presets. Just 47 presets! Some AU stability issues. Audio Damage has a well-earned reputation for making bonkers plugins that revel in tearing up the rulebook, so it's surprising that its latest, Basic (VST/AU), is as simple a synth as you could reasonably imagine. With the same topology as the Minimoog - itself quite straightforward - Basic houses three oscillators and a noise generator, with oscillators 2 and 3 syncable to oscillator 1, and all three powered by sampled waveforms. "The sound is very satisfying and useful, and, with the right tickling, can sound convincingly old-school"
After the oscillators comes a pair of multimode (low-, high- and band-pass) filters running in series. They've got Frequency and Resonance controls and are receptive to three simultaneous modulation sources: LFO, Envelope and MIDI Velocity. Next come ADSR envelopes for the amplitude and filter. The amp envelope is velocity-sensitive and features a retrigger mode for the release, controlling whether or not the previous note must be released before the next note's attack begins. Further modulation duties are handled by the LFO, which can be routed to all three oscillators, the filter and the amp. The LFO shapes are Sine, Ramp/Saw, Square and Random, with all but Square allowing a degree of wave-shaping using the Shape slider. The LFO can run free or synced, and both the Mod Wheel and Aftertouch MIDI controllers can modulate its amplitude. Finally, the output stage has sliders for saturation (Dirt) and Output level. The latter is designed to apply soft limiting at high levels and won't allow the signal to leave the plugin at any more than -2dB. 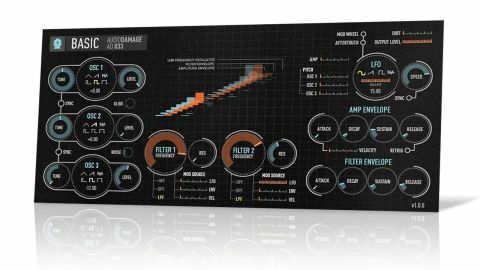 With nothing in the way of eye-candy except for a nifty animated 3D graph visualising the movement of the envelopes and LFO, Basic certainly lives up to its name - but in this case, simple and affordable doesn't mean cheap and nasty. Basic isn't likely to set the synth world on fire, clearly, nor is it the last word in pure analogue-style sound, but its simple layout and rudimental feature set encourage you to experiment and actually build your own patches from scratch, making it ideal for students, beginners and even seasoned producers jaded by endlessly flicking through presets. The sound is very satisfying and useful, and, with the right tickling, can sound convincingly old-school - covering all the classic monosynth bases (and, indeed, basses) - but with the cleanliness needed for modern styles. The additional waveforms also open up a broader sonic palette than a strict Moog emulation, but without adding any additional complication. The only problem we encountered was some instability with the AU version, whereby output dies and the synth has to be reloaded (with unsaved patches getting lost in the process). This will cause some frustration for Logic users but should be addressed in an update at some point. Like the Minimoog that inspired it, Basic makes a fun and creative addition to any studio and is keenly priced enough to tempt beginners and pros alike. If you've forgotten what it's like to program a synth - or never knew in the first place - the simple layout, focused feature set and lack of graphical distractions makes it genuinely inspirational when it comes to patch-building.